The Sharks continued their usual up and down rollercoaster style of play this weekend, playing against a tough Blues team and a Colorado Avalanche squad who finally ended the Blackhawks’ historic run. All three teams are fighting for position in a tight Western Conference, meaning every point is critical. There was some good and some bad from this weekend. So let’s just get right into it. Good: The Sharks scored three goals in a game. The offense got going against the Blues, putting up three goals, and going into the third period up 3-1. 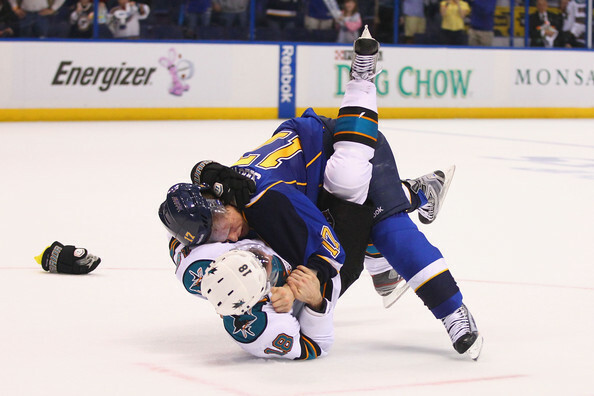 Not so good: The Blues scored four, including the overtime winner. Good: Scott Gomez got it going against the Blues. Gomez is playing well right now, getting his second goal in three games and an assist against the Blues. Not so good: Ryane Clowe is still struggling. Clowe is set to have a breakout game soon, right? Right now, he’s doing two things: generating chances and turning over the puck. Unfortunately, I saw the turnover machine operating at full speed this weekend. Good: Niemi bounced back against the Avs. Niemi looked good against Colorado, making huge save after huge save, and helped the Sharks battle back from a 2-0 deficit. Not so good: The offense didn’t. Again, the offense managed to get no more than two goals, while going 0-5 on the power play. Good: The Sharks got two points. Not so good: The points both came in overtime losses, giving opponents valuable points in a tight race. Tommy Wingels is back, and looks fantastic up on the top line with Thornton and Couture. He brings the speed and tenacity that is needed in the top six. Matt Irwin looks like the real deal. He’s playing solid defense and has a straight up canon from the point. I hope he stays in the lineup long term. With Irwin playing well, the Sharks have an excess of outstanding defensemen. It looks like it might be time to try to move some pieces to add offense. Next game is at St. Louis on Tuesday. A win would be nice. Let’s go Sharks.